Order a free sample of the Quick Hook, which comes with both height hooks, to determine the right hook height for your job. 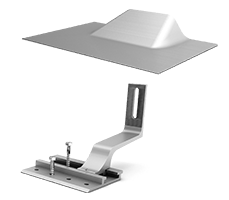 All Quick Mount PV tile mounting products are designed to comply with the roofing best practices listed by the Tile Roofing Institute (TRI) for tile penetration flashing (MC-02). The photos below show our QBase Universal Tile Mount. 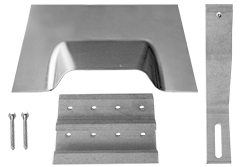 The same waterproofing methods are recommended for all of our tile mounting products. For more info go to www.tileroofing.org or contact . In retrofit installations where the standoff and primary flashing do not fall in a position that is close to the overlap of felt paper, an approach that is sometimes called "bibbing" can be used. When the overlapping drip edge of the felt paper ends in the tile course above the penetration, a separate piece of felt paper is positioned under the battens and overlapping felt, which then extends down to bib around the penetration and over the deck flashing.